13 September 2018 "Part of the Team"
Submitted by Mike Penn on 12 September 2018. In a little more than two months, I’ll be getting on an airplane to go to Antarctica. 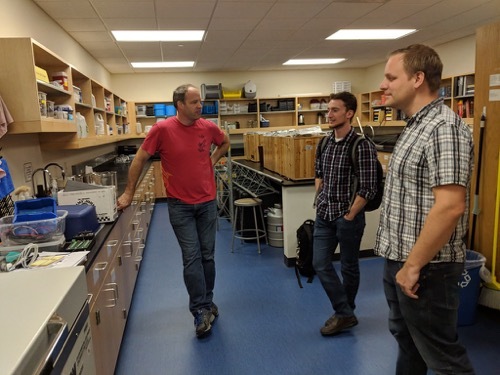 It is beginning to seem more real every day, especially after having spent the last week with the AWS research team at the University of Wisconsin in Madison, Wisconsin. I had a very informative week, but more than being informative, it was reassuring. I try to be a very competent, knowledgeable and capable man. I’m generally in a leadership position in most of the things I’m involved in and I generally know what I’m doing and how to do it. But not this time. This time I’m not the leader. I don’t know exactly what I’m doing and I don’t really know the people I’m going with. This trip to visit my team changed all of that. I spent several days actually being able to see and handle the equipment that we would be installing, troubleshooting, and maintaining in Antarctica. This is a terrible picture of the team. Trust me, they are good guys! David Mikolajczyk (who will be deploying with me) and I sat in on a meteorology class taught by Dr. Matthew Lazzara (the PI - Principal Investigator of the AWS project). 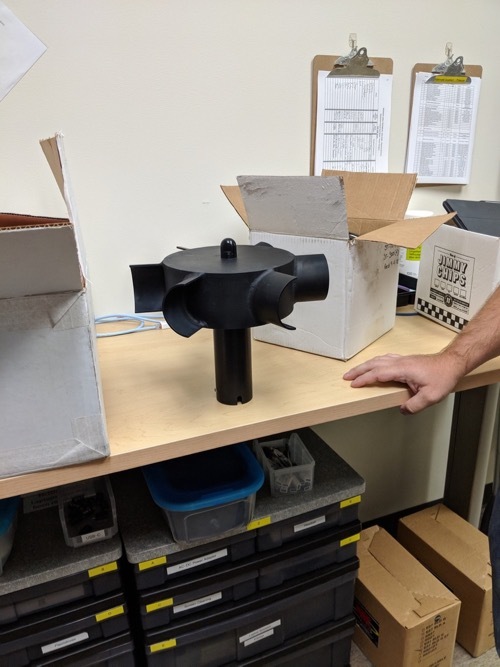 This is a heavy duty wind speed sensor for locations with extremely high winds. Dave and Lee Wellhouse (with whom I am scheduled to go to the South Pole) showed me the instruments that will be installed. 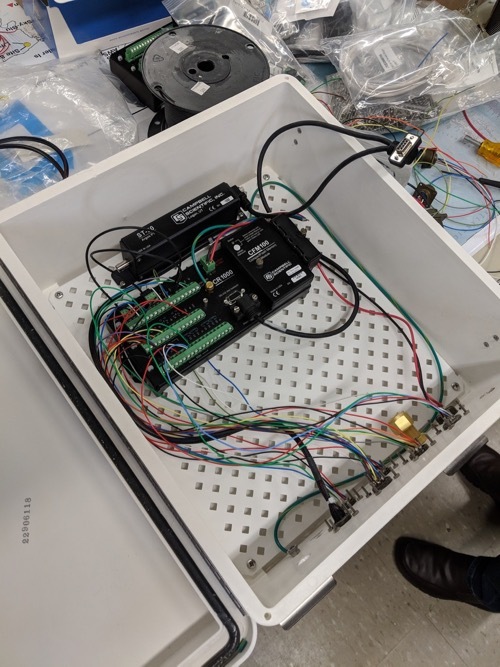 This is an enclosure that houses and protects the memory and parts that communicate with satellites to send the data that the Automatic Weather Station has collected. They carefully explained what the function of each instrument is, how it works, and we even discussed the power demands of each instrument. This is a new aerovane that will be going with us to Antarctica as a replacement. This instrument reads wind speed and direction. Andy Kurth, the Electrical Engineer who designs the internal electronic components, explained the extreme conditions in which the equipment is expected to function and showed me a special extreme low temperature freezer that is used to test the components to ensure that they can operate in the extreme cold. This is an extreme low temperature freezer used to test electronic components for use in the Automatic Weather Stations. Notice Han Solo? George Weidner (the most seasoned of the team) filled me in on very useful information that I would need in Antarctica and some history of the program. 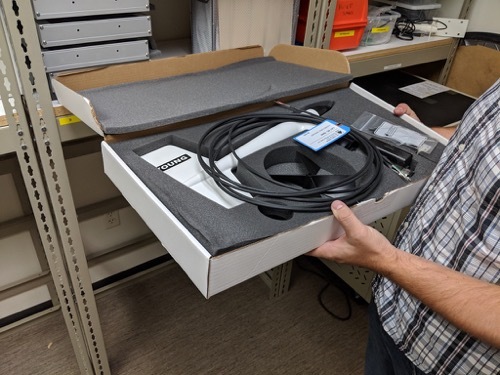 While learning about the hardware, sensor housings, temperature tolerance ranges, and thermometer accuracy was important to me, there was something else that I hoped to get from the visit. Going to Antarctica is a big deal. Going to the Antarctic with a bunch of strangers could cause some stress. What I was very happy to learn is that I’m not going to deploy with a bunch of strangers, I’m deploying with a bunch of new friends. Not only am I more familiar with the AWS equipment, but more importantly I'm much more familiar with the AWS team! One of my PolarTREC scientists is at that school. I’m jealous you got to visit. Bailey, we will be bringing some spare parts with us to replace broken parts. When we are at McMurdo and South Pole Stations we will have a workshop and laboratory to fix whatever can be repaired. Hi, i am a student at Dansville schools. I was wondering if there is any technology that you had never heard of that you are using on your trip? Ryan, most of the equipment that we will be working with is pretty standard. The thing that is different about it is that it is specially made to operate at temperatures as low as -140˚ and wind speeds as high as 200 miles per hour. Riley, There are two reasons for the picture of Han Solo is on that freezer. The first is, in that movie, Han was captured and frozen and carried out in a block. 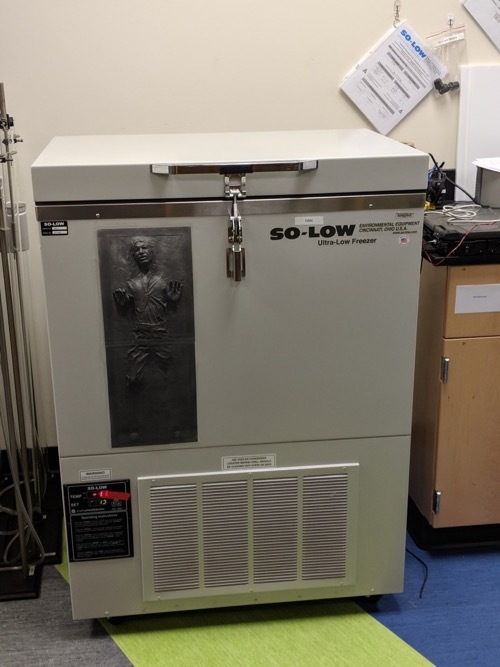 The other reason is the name of that type of freezer is "So-Lo" which is very much like Han Solo's name. Hi this is cole from Dansville middle school and I was wondering what all you have to wear so you don’t freeze . Cole, when we travel to Antarctica, we stop in Christ Church, New Zealand. While we are there, we will get our Extreme Cold Weather gear. There is a big goose down coat called "Big Red" and big white boots called "bunny boots." It is some of the best equipment available. I'll be visiting Dansville in a few weeks and hopefully, I can show you some of that gear. Hi my name is Haydon and i am a student at Dansville Middle what does the person on the freezer represent? Haydon, please look at the response I wrote to Riley - it answers your question about the person on the freezer. Hi, my name is Rowan and i ama student at Dansville and i was wondering what is your favorite equipment to use? Rowan, Since I haven't gone yet, I'm not sure which will be my favorite. I'll let you know when I get back. I am looking forward to flying in the helicopters and maybe the snowmobiles. I'll probably be using a shovel quite a lot, but that probably won't be my favorite piece of equipment!